Elaine Chao has cleared the nomination process to take the wheel at the Transportation Department – despite protests from a partisan Democratic senators. Chao received overwhelming bipartisan support with 93 Senator votes. A gang of six Democratic senators (including Cory Booker (D-NJ), Chuck Schumer (D-NY), Kirsten Gillibrand (D-NY), Jeff Merkley (D-OR), Bernie Sanders (I-VT) and Elizabeth Warren (D-MA)) voted against her in protest, but this was one of the most agreeable confirmation processes for President Trump’s cabinet picks. As the new Transportation Secretary Chao faces at least three big issues: driverless cars, aviation legislation, and infrastructure. President Trump has signaled that he plans a massive infrastructure project and groups are pushing for Congress to enact a Federal Aviation Administration reauthorization that privatizes air traffic control. The pace of technology in the development of autonomous cars though will be a test for Chao. The question is what she sees as the role of Washington in the process. We do have some clues. The innovation and creativity of our country is unsurpassed in the world, and so we have a responsibility to ensure that that creativity and that innovation remains. Obviously, with these new emerging technologies, there has now surfaced a number of key issues, privacy among them, that are very worrisome to a whole host of people. Safety is another. As these emerging technologies are coming up, they’re faced with state-by-state regulations, which also present a new challenge as well. Yet there are many benefits, for senior citizens who may not want to drive, autonomous vehicles are a way to give them back their freedom. So there are pros and cons, and we need to have a national dialogue about all of this. And as I said, the regulations at the federal level are in their infancy, and we need to work with members of the congress and all of you on this committee to make sure that we’re not dampening this creativity, and yet we’re also assuaging the real deep-seated concerns that so much of our public — many of our public — on some of the issues that these new emerging technologies bring. Chao is no stranger to the White House cabinet. She served as Transportation Under Secretary for both Bush Administrations and as Secretary of Labor in the George H.W. Bush Administration. Chao, an immigrant from Taiwan, also held top positions including at the Peace Corp and United Way – a testament that the American Dream is still alive. 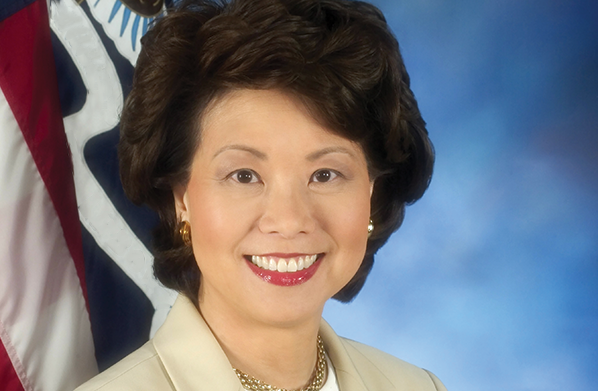 “We welcome the opportunity to work with [Elaine Chao] on bringing the safety and mobility benefits of fully self-driving vehicles to America’s roads and highways,” the Self-Driving Coalition’s General Counsel David Strickland wrote in a statement. "We have the utmost respect for Elaine Chao, an accomplished public servant and highly capable leader,” Adrian Durbin, Lyft’s spokesperson, told Recode. Uber’s head of federal affairs, Niki Christoff, echoed Lyft’s sentiment and said, “Ms. Chao's knowledge of transportation issues is extensive and we look forward to working closely with her." We’re hopeful that Chao will continue to be a supporter of innovation and technology. A smart approach to federal involvement in the technologies that are disrupting how we move goods and people around, should not be to hoist unnecessary burdensome regulations that can’t be keep up with the pace of development, but to allow for flexibility so that innovation can develop better products and services for us all.